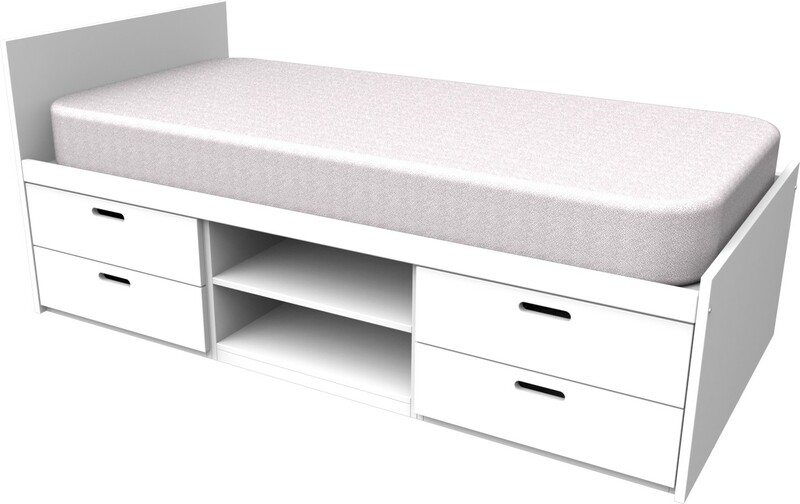 The Cheyenne Collection White Storage bed is ideal for maximising space in your child's bedroom. This bed has 4 drawers and an open shelf creating a perfect place for storing clothes or shoes. The base of this storage bed is made from white edge banded laminate, and the drawers are available in a range of colours ideal for suiting many decors and your little ones personal style. Cheyenne Collection White Storage Bed. Made from white laminate with painted MDF drawers finished in Arctic White. Ideal for adding a splash of colour. The drawers are set on easy glide runners, a soft close option is also available. Please note colours may vary depending on screen resolution. Please request sample colours from our team to view an accurate representation.